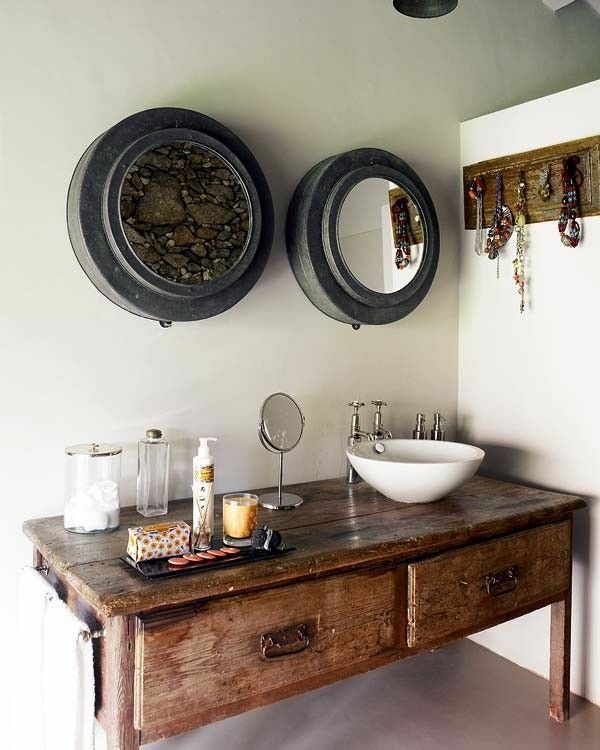 A reclaimed bathroom vanity unit can add warmth and character to any bathroom. The use of reclaimed desks and drawer units in bathrooms is a great idea. With all of the tiling and white porcelain bathrooms can look rather cold and clinical. An old piece of furniture used like the one below to mount a counter top wash basin and taps can add a much needed warm lived in feel to a bathroom. Admittedly this one works better in a larger well lit bathroom. This picture is from freshome.com in Portugal. The vanity unit below looks great in this small wet room installation. It was a rather battered pine set of drawers that we painted with a slightly distressed look. Combined with the countertop basin and the wall mounted tap it worked really well. We fixed the top two drawers in place to conceal the waste plumbing. The bottom three drawers are fully functioning. 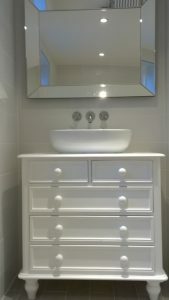 This old chest of drawers makes a beautiful and practicle vanity unit. You can use most furniture pieces but it is better to use something old that has stood the test of time. New wood can shrink and twist in the warm damp environment of a bathroom. The downside is that it will need some maintenance to keep it looking good. The benefit is a great looking practicle vanity unit that doesn’t cost the earth – made of solid timber.